As fickle as it can be, spring has decided to stay so there is more sunshine to enjoy with only a few rainy/snowy days sprinkled here than there. 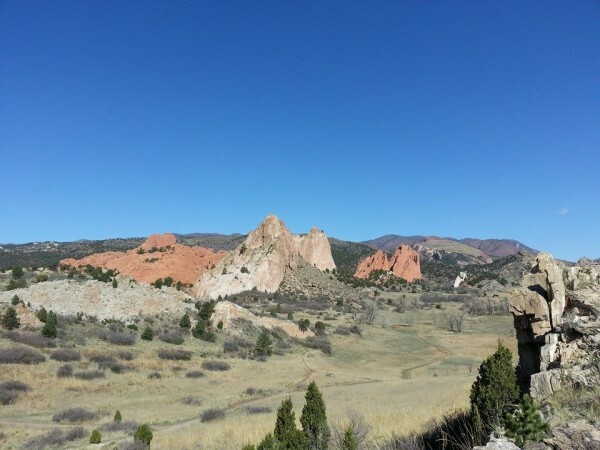 This past weekend we took advantage and headed to Garden of the Gods for a hike. I never tire of its rugged beauty. No filters or editing, the sky really is that blue. While we’re not quite ready for shorts and sandals, it is warm enough to start lighting the grill to enjoy the flavors that beckon us to schedule summer gathering. I’ll tell you straight away, vegetables are not my first thought when the coals are hot and the wine is flowing, it’s steak, always steak. Thick, bone-in rib eyes or porterhouse, to be exact. But juicy steak needs crisp-tender vegetables in a rainbow of colors for healthy balance so we may as well grill those too. The key to grilling vegetables on skewers like kabobs is pairing like items–tomatoes with tomatoes, peppers with peppers–each one can be removed from the heat as needed. (Although, garlic cloves are happy to mix with the peppers.) No one looks forward to limp squash or under-cooked onions and you want those tomatoes charred and ready to burst. For me, skewers are more about function than presentation, a way to keep the everything from falling through the grill grates. Grill baskets are great, but when mixing vegetables in the basket they don’t get the individual attention they deserve. Sliced squash and onions require less fuss and go directly on the grill, so life just got even easier. Once all the vegetables are done to your liking, remove from skewers and toss together for a perfectly cooked, beautiful side dish. These roasted veggies have so much flavor and make a great side dish with grilled meats or fish. 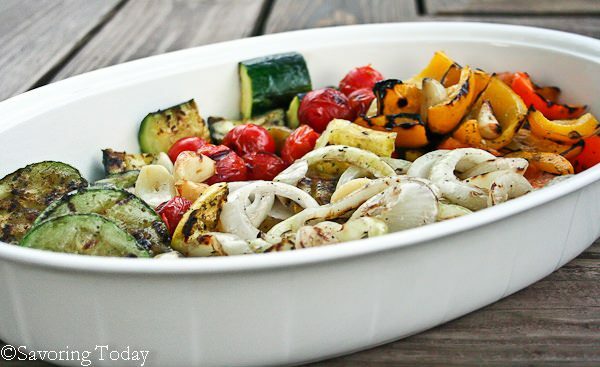 Arrange sliced squash, onion discs, and skewers on a rimmed baking sheet and brush with olive oil to lightly coat. 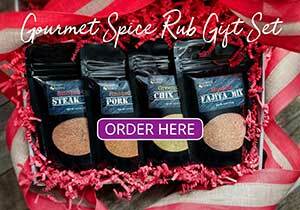 Season generously with salt and pepper, then sprinkle with herbs. Grill over med-high heat until browned with grill marks on each side until crisp-tender. Brush with olive oil on uncooked side just before turning. 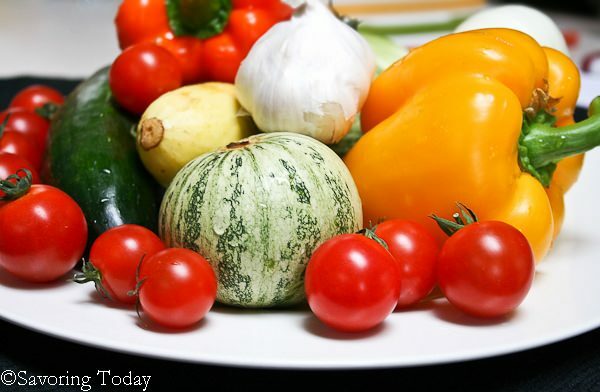 Remove each type of vegetable when done and place back on the rimmed baking sheet. Remove skewers from tomatoes, peppers, and garlic. Remove peel from garlic (roasted garlic should pop right out) and slice squash into bite-size pieces. Keep in a warm oven until ready to serve. Mix vegetables together on a large serving tray, taste and season with salt and pepper, as needed; serve warm. By placing like items on skewers--tomatoes with tomatoes, pepper with peppers--each one can be removed from the heat when done without leaving other items under-cooked. Finished vegetables can be placed in a warm oven until ready to serve. Suggestions: Use leftovers for frittatas, soups, Alfredo, pizza, rice pilaf, fajitas, and salads. Grilled vegetables can be frozen, however there is a change in texture. Once frozen, use in recipes like soups, casseroles, or a frittata where the texture is not as pronounced. Your roasted veggies are so colorful and simply delicious. I am so excited for grilling season but not to rub it in I grill all year around in Hong Kong. Well actually, I also used to grill all year around in Michigan too but just shoveled a path and wore boots instead of flip flops to grill. Have a super weekend! Love this dish, the grilling process will give it a nice smoky and sweet flavours. Yum! I actually wore shorts on our morning walk today! It was in the low 60s — a bit chilly at first, but after a couple of minutes quite pleasant. 😉 Anyway, love grilled veggies! Haven’t done any yet this season — need to get on it. Good stuff — thanks. Well, now we have 4 inches of snow, while temporary is a reminder it’s not quite time to pull out the flip flops. I love that top photo!! 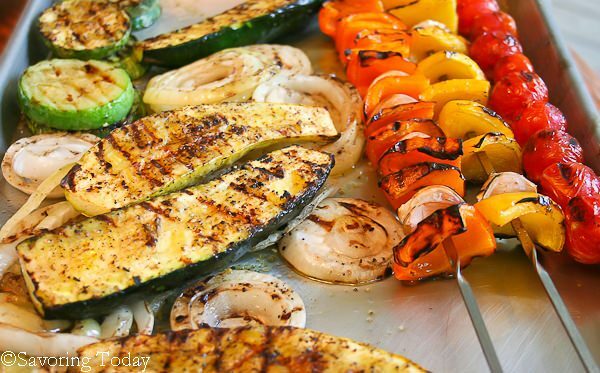 We love grilled veggies. I have never used skewers for them though – grand idea.